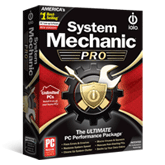 System Mechanic Pro is a computer optimization software that has proven to stand the test of time, it is a comprehensive PC maintenance tool with a difference. This utility software is neither too complicated nor intrusive, it is a complete PC maintenance suite for windows, older machines and newer computers alike. From windows registry optimization, hard disk drive integrity protection, disk fragmentation to Startup Optimization and system memory performance boosting; System Mechanic Pro takes into account – all that is making your computer slow down, draining your battery power or eating up the running memory and reshapes them for optimal result. System Mechanic pro as a PC repair and maintenance software is a well known optimization tool and works well on all Microsoft Windows Operating System (OS) later than XP service pack 3. The features below are found in the newer versions of the software and tailored towards giving the user a better PC response rate and highly optimized registry. A dynamic real-time power optimizer, PowerSense senses was PC users are doing and automatically optimizes the power settings of their PC to maximize their computer experience. For example, if a user is doing a resource-exhaustive activity like gaming or editing, PowerSense snaps into Ultra Performance Mode to focus on the power on the intense session. Or, if the user is doing something simple like checking email or just surfing the web, Endurance Mode kicks in and saves battery. LiveBoost feature of the System mechanic pro automatically keeps the key elements of responsive computing (RAM, CPU and storage), optimized in real-time so a PC stays in top reactive condition. With Liveboost, there’s a highly optimized CPU, RAM and disk drives, making the PC easier to use in real-time. Another interesting feature of the system mechanic pro software is the NetBooster which automatically optimizes Internet settings and connections to improve overall Internet speed and browser’s performance even on slower connections. Startup Optimizer feature of the system mechanic software can be a real time saver after loading your computer with many software some of which get loaded in the system start-ups. It can greatly accelerate your PC startup in 22 different ways, letting you to use your computer quicker. CRUDD Remover is a feature of the system mechanic software that takes care of programs that bog down your PC by identifying and removing them. ActiveCare feature helps you automate stuff in real-time; turns on features when necessary and disables them when they are not needed. System mechanic is a software worth using when PC tuning is a priority or the computer is slow, buggy, taking like forever to startup and responding slowly. You can read more it and their full features from http://www.iolo.com.